The Millau Viaduct, Saint-Nazaire Bridge and the East-European high-speed line in France, the Grand Ravine Bridge in Réunion, the Channel Tunnel between France and the U.K., and the Moscow-Saint Petersburg motorway: these are just some of the prestigious projects our teams have worked on. For more than 60 years, setec group has developed the skills to meet project design needs, covering geotechnology, structures, materials, diagnostics, hydraulics, safety, traffic studies, technical and contractual management, and more. 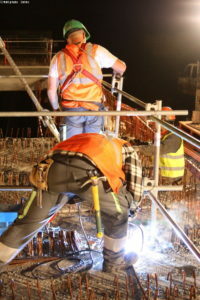 setec carries out comprehensive studies and manages work on major bridge and viaduct projects (e.g. the Millau Viaduct, the Sioule Viaduct and the Grande Ravine Bridge), linear infrastructure (roads, motorways and railways, numerous road and rail tunnels) and more. The group’s experts work alongside specialists in every discipline (geotechnology, hydraulics, structure, materials, environment, security, traffic management equipment, etc. ), from the design to the construction phases. As a result, the group has also earned a strong reputation in historic structures, carrying out diagnostics and repairs as necessary (e.g. the Grand Palais, Aquitaine Bridge, Saint-Nazaire Bridge, etc.). Our teams work on the different upstream phases (design, site integration and fit with the expected traffic), and then launch calls for tender, manage contracts, coordinate suppliers and plan the work. They study traffic, tolls and finance for road and rail projects. The same teams, joined by rail specialists, carry out studies and monitor work on major sections of new rail lines. setec now integrates Building Information Modeling (BIM) into road and rail projects. 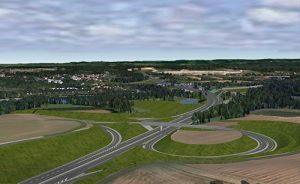 At the cutting edge of this approach, setec’s modeling of the A36-RN1019 intersection at Sevenans enabled the company to carry out the project studies while meeting the client’s request for a fully integrated process. The aim was to introduce BIM at the design phase and extend it to the implementation phase, submitting a model of the completed project to the owner. This innovative technological approach facilitated team collaboration. The absolute record project. In 2013, setec won the "major civil engineering project of the last 100 years" for the design and project management of the Channel Tunnel. The 1750m long Croix Rousse Tunnel was commissioned in the early 1950. The longest cable stayed bridge in Africa with 200 meter high pylons. setec performed the design of the structure, the control of execution studies and construction methods and a permanent on-site technical assistance to Autoroutes du Maroc.